DCI Monika Paniatowski investigates the killing of an American guest – and uncovers a link to a 50-year-old murder. When the body of an American woman is found in the Prince Alfred suite at the Royal Victoria Hotel, DCI Monika Paniatowski is faced with one of the most baffling cases of her career. The woman who called herself Mary Edwards had been a guest at the hotel for the past two weeks, having paid cash in advance. But who was she really – and what was she doing in a small town like Whitebridge? 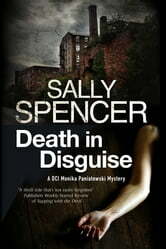 If Monika could discover why the dead woman had come to Lancashire, she would be one step closer to catching her killer. The investigation takes an intriguing twist when Monika learns of a possible link to a fifty-year-old murder – but the only person who could tell her why it’s relevant is lying in a coma.